Are you looking for an engaging experience with an award-winning team? We’re currently looking for individuals who have the DEVENEY spark for the summer term. Want to know what associate life is all about? Check out this series for a sneak peek into a day in the life of a DEVENEY associate. Miss the first installment? Read about being a PR associate here, and read on to learn more about our Creative Associate Anna Koeferl. 9 a.m. – *Attend morning stand-up with the creative team. 10 a.m. – Brainstorm design ideas for a Windsor Court project. 11 a.m. – Create DEVENEY Instagram visual with text overlay on InDesign. 1 p.m. – Have lunch with fellow associates to check-in on the semester project. 2 p.m. – Check-out SLR camera for a lifestyle photoshoot of DEVENEY office spaces and nearby Magazine Street spots. 4 p.m. – Upload photos from the photoshoot and begin editing on Photoshop for web-optimized quality. *Morning stand-up is the creative department’s daily check-in to review ongoing projects and prioritize everyone’s assignments for the day. It’s an opportunity to find ways to collaborate and hear each other’s fresh ideas. Whether a job is cool (long lead), warm (shorter lead) or hot (quick turnaround), there’s always something happening. Anna is a New Orleans native who returned home after graduating from the Maryland Institute College of Art (MICA). Being a creative associate at DEVENEY is helping Anna pursue her dream of becoming an art director. Outside of work hours, you can find her painting and making illustrations. 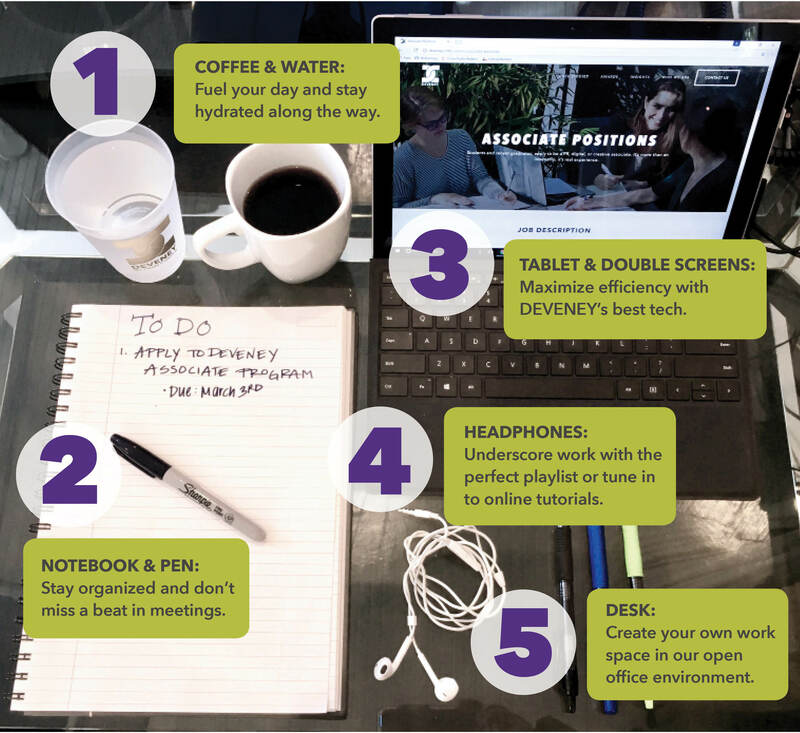 Tweet @DEVENEYMKTG to share how you ensure success in your workday. Think you have what it takes to be one of our next associates? Applications are open for the 2017 Summer Associate Program and Summer Scholar position. For more information, and to apply, click here or email associateprogram@deveney.com.